Good morning my Cutting Edge Stencils friends! 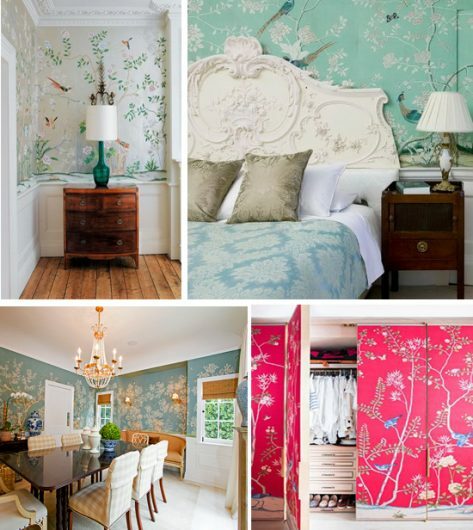 We are absolutely in love with the Chinoiserie home decor trend. This look became popular in Europe in the 18th century and is a western interpretation of Chinese motifs and designs. It has since maintained a quiet presence until its recent uptick in popularity. 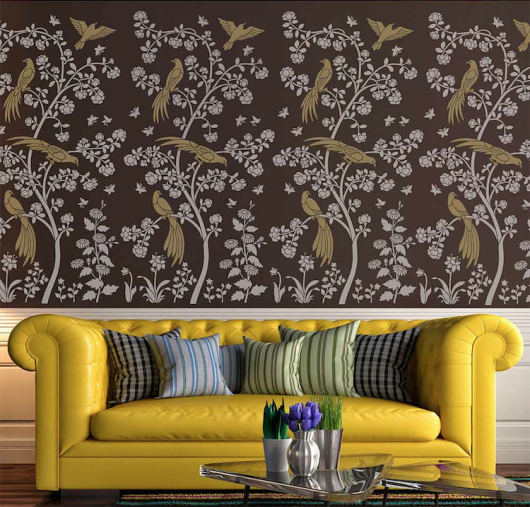 Today we’re going to show you how our stencils can help you achieve the Chinoiserie chic style you desire. What is Chinoiserie Home Decor? It literally translates from French to “Chinese-esque” and refers to a combination of Eastern and Western style elements. Think blue and white ceramics, glazed furniture and hand-painted wall hangings all embellished with whimsical design elements featuring nature, dragons, and Chinese architecture (such as pagodas). 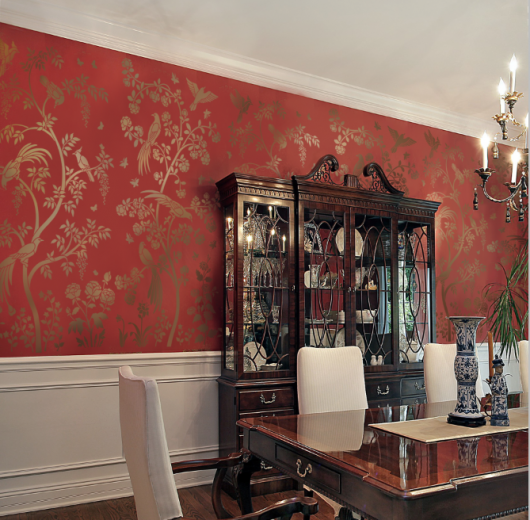 Chinoiserie designs bring worldly sophistication to any space. So are you loving this trend as much as we are? We bet you are! This exquisite finish has been spotted in multiple design publications as it increases in popularity. Unfortunately, this elegant decor style has not been very attainable until now. 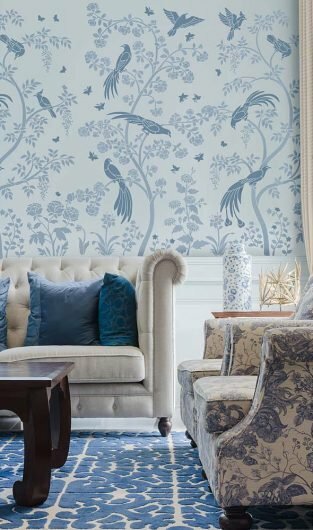 Chinoiserie wallpapers are typically hand painted on silk and we’ve spotted these pricey papers ranging from hundreds to thousands of dollars. 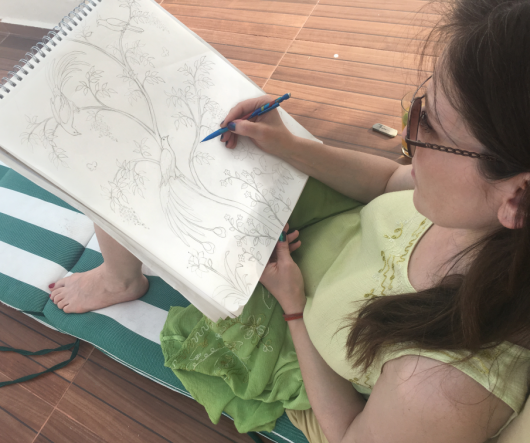 That’s why Janna Makaeva, one of the Cutting Edge Stencils owners and the creative designer behind our stencil designs, decided to hand craft our versions of this timeless style. 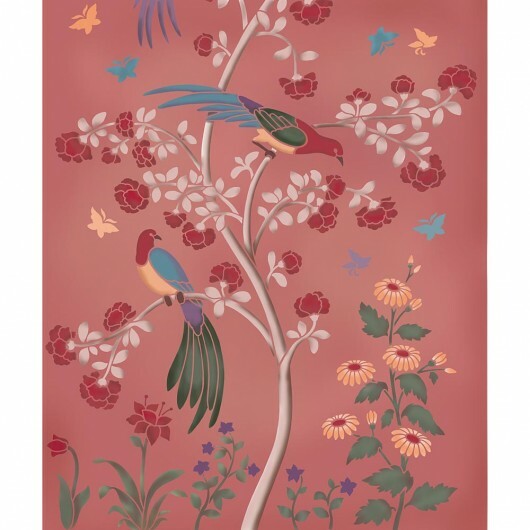 A fit for both the traditional home or to add a delicate contrast in a more modern space, Chinoiserie can add a pop of color or a unique design to any area. 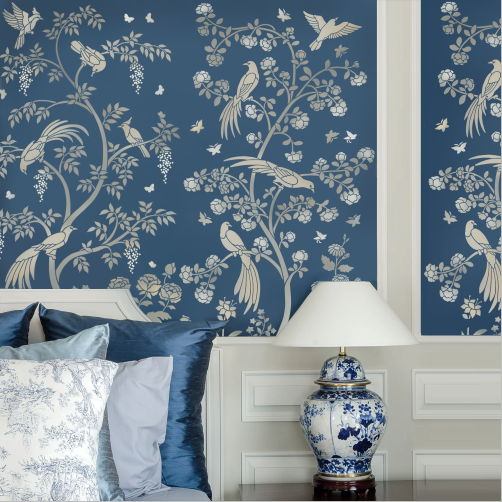 For savvy decorators looking to add the latest trend to their homes, Cutting Edge Stencils is proud to announce our Chinoiserie Collection. 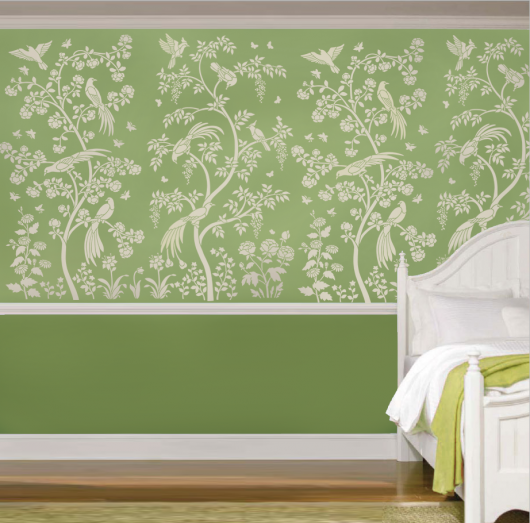 Our wall stencils make it easy to stay in budget while adding timeless style to your home. 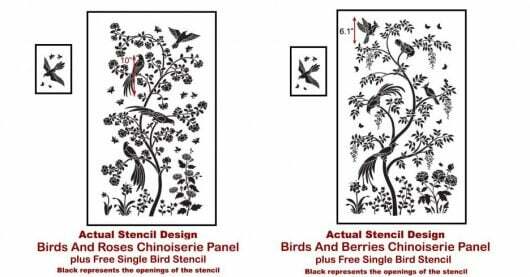 Our Chinoiserie Stencils, include Birds and Berries Chinoiserie Wall Mural and Birds and Roses Chinoiserie Wall Mural, can simply be rolled on the wall in one color for a subtle yet sophisticated look. 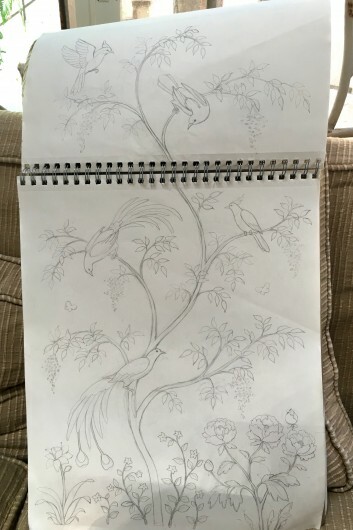 Or it could be further enhanced by painting the birds in a contrasting color using a stencil brush. If your inner artist has been begging to get out, you could easily consider making this a multi-color project using several stencil brushes. And let’s not forget how a metallic paint can add glitz and glam to any stencil project. 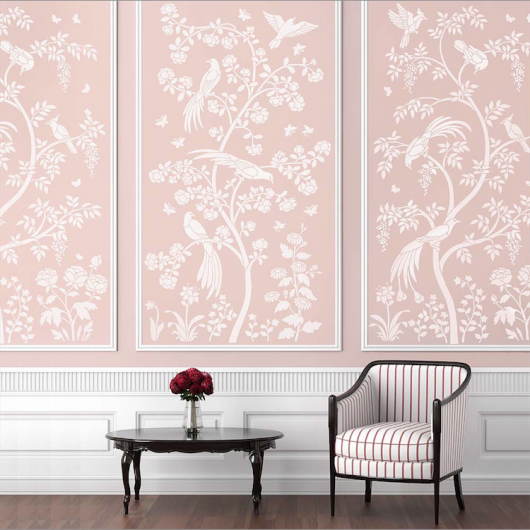 Our new Chinoiserie stencils are large wall panels that do not have an interlocking feature like some of our allover stencils. These oversized panels are designed to fit above the chair rail. If you do you not have a chair rail, simply mask it with tape and paint it right on the wall. We recommend purchasing a set, which includes two large wall stencils, so that you could alternate the patterns on the wall. It allows the design to look less repetitive. However the great thing about wall stencils is that you can obtain the look you desire so one pattern can look equally impressive. Cutting Edge Stencils also includes a free stencil with all purchases. 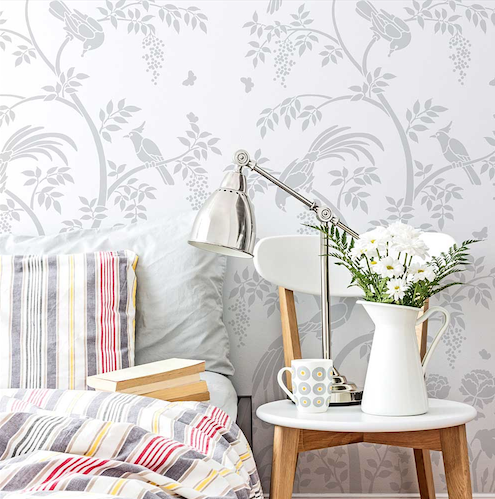 The additional bird and butterfly stencil patterns are designed to work with your wall panel so you’ll spot them in your package. These small tokens of appreciation can be used to add interest to the current designs where you see fit. From accent walls to room screens to canvas art, the possibilities are endless with this new collection! 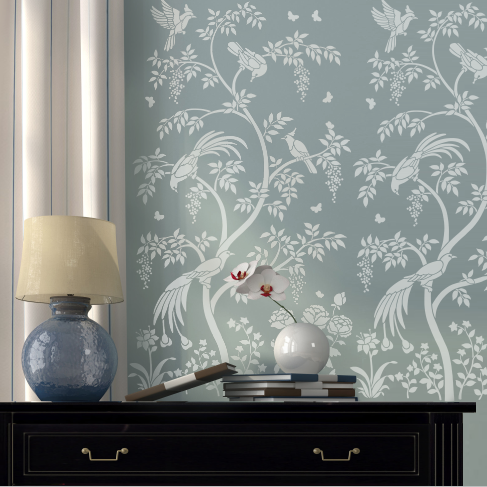 Tell us, what do you think of our new Chinoiserie Wall Stencil Collection? We’d love to read you thoughts on this trend in the comments below. Shop our new stencil designs and find the perfect stencil for your project! Introducing NEW Trendy Stencil Designs! Inspiring Stencil Projects of the Week! Tutorial: Stenciling with Rabat Allover Stencil Pattern!